Sheet metal is metal formed by an industrial process into thin, flat pieces. Sheet metal is one of the fundamental forms used in metalworking and it can be cut and bent into a variety of shapes. Countless everyday objects are fabricated from sheet metal. Thicknesses can vary significantly; extremely thin sheets are considered foil or leaf, and pieces thicker than 6 mm (0.25 in) are considered plate steel or "structural steel." In most of the world, sheet metal thickness is consistently specified in millimeters. In the US, the thickness of sheet metal is commonly specified by a traditional, non-linear measure known as its gauge. The larger the gauge number, the thinner the metal. Commonly used steel sheet metal ranges from 30 gauge to about 7 gauge. Gauge differs between ferrous (iron based) metals and nonferrous metals such as aluminum or copper. Copper thickness, for example, is measured in ounces; representing the weight of copper contained in an area of one square foot. Parts manufactured from sheet metal must maintain a uniform thickness for ideal results. Hand-hammered metal sheets have been used since ancient times for architectural purposes. Water-powered rolling mills replaced the manual process in the late 17th century. The process of flattening metal sheets required large rotating iron cylinders which pressed metal pieces into sheets. The metals suited for this were lead, copper, zinc, iron and later steel. Tin was often used to coat iron and steel sheets to prevent it from rusting. This tin-coated sheet metal was called "tinplate." Sheet metals appeared in the United States in the 1870s, being used for shingle roofing, stamped ornamental ceilings and exterior facades. Sheet metal ceilings were only popularly known as "tin ceilings" later as manufacturers of the period did not use the term. The popularity of both shingles and ceilings encouraged widespread production. With further advances of steel sheet metal production in the 1890s, the promise of being cheap, durable, easy to install, lightweight and fireproof gave the middle-class a significant appetite for sheet metal products. It was not until the 1930s and WWII that metals became scarce and the sheet metal industry began to collapse. However, some American companies, such as the W.F. Norman Corporation, were able to stay in business by making other products until Historic preservation projects aided the revival of ornamental sheet metal. Grade 304 is the most common of the three grades. It offers good corrosion resistance while maintaining formability and weldability. Available finishes are #2B, #3, and #4. Grade 303 is not available in sheet form. Grade 316 possesses more corrosion resistance and strength at elevated temperatures than 304. It is commonly used for pumps, valves, chemical equipment, and marine applications. Available finishes are #2B, #3, and #4. Grade 410 is a heat treatable stainless steel, but it has a lower corrosion resistance than the other grades. It is commonly used in cutlery. The only available finish is dull. Grade 430 is popular grade, low cost alternative to series 300's grades. This is used when high corrosion resistance is not a primary criterion. Common grade for appliance products, often with a brushed finish. Aluminum is also a popular metal used in sheet metal due to its flexibility, wide range of options, cost effectiveness, and other properties. The four most common aluminium grades available as sheet metal are 1100-H14, 3003-H14, 5052-H32, and 6061-T6. Grade 6061-T6 is a common heat-treated structural aluminium alloy. It is weldable, corrosion resistant, and stronger than 5052, but not as formable. It loses some of its strength when welded. It is used in modern aircraft structures. Brass is an alloy of copper, which is widely used as a sheet metal. It has more strength, corrosion resistance and formability when compared to copper while retaining its conductivity. In sheet hydroforming, variation in incoming sheet coil properties is a common problem for forming process, especially with materials for automotive applications. Even though incoming sheet coil may meet tensile test specifications, high rejection rate is often observed in production due to inconsistent material behavior. Thus there is a strong need for a discriminating method for testing incoming sheet material formability.The hydraulic sheet bulge test emulates biaxial deformation conditions commonly seen in production operations. For Forming Limit curves (FLCs) of materials Aluminium, Mild steel and Brass.Theoretical analysis is carried out by deriving governing equations for determining of Equivalent stress and Equivalent strain based on the bulging to be spherical andTresca’s yield criterion with the associated flow rule. For experimentation Circular Grid Analysis is used. Investigation of Forming Limit Curves of Various Sheet Materials Using Hydraulic Bulge Testing With Analytical, Experimental and FEA Techniques. Available from: https://www.researchgate.net/publication/321168677_Investigation_of_Forming_Limit_Curves_of_Various_Sheet_Materials_Using_Hydraulic_Bulge_Testing_With_Analytical_Experimental_and_FEA_Techniques. During the rolling process the rollers bow slightly, which results in the sheets being thinner on the edges. The tolerances in the table and attachments reflect current manufacturing practices and commercial standards and are not representative of the Manufacturer's Standard Gauge, which has no inherent tolerances. where k is a factor taking into account several parameters including friction. T is the ultimate tensile strength of the metal. L and t are the length and thickness of the sheet metal, respectively. The variable W is the open width of a V-die or wiping die. The curling process is used to form an edge on a ring. This process is used to remove sharp edges. It also increases the moment of inertia near the curled end. The flare/burr should be turned away from the die. It is used to curl a material of specific thickness. Tool steel is generally used due to the amount of wear done by operation. It is a metal working process of removing camber, the horizontal bend, from a strip shaped material. It may be done to a finite length section or coils. It resembles flattening of leveling process, but on a deformed edge. Drawing is a forming process in which the metal is stretched over a form or die. In deep drawing the depth of the part being made is more than half its diameter. Deep drawing is used for making automotive fuel tanks, kitchen sinks, two-piece aluminum cans, etc. Deep drawing is generally done in multiple steps called draw reductions. The greater the depth, the more reductions are required. Deep drawing may also be accomplished with fewer reductions by heating the workpiece, for example in sink manufacture. In many cases, material is rolled at the mill in both directions to aid in deep drawing. This leads to a more uniform grain structure which limits tearing and is referred to as "draw quality" material. Expanding is a process of cutting or stamping slits in alternating pattern much like the stretcher bond in brickwork and then stretching the sheet open in accordion-like fashion. It is used in applications where air and water flow are desired as well as when light weight is desired at cost of a solid flat surface. A similar process is used in other materials such as paper to create a low cost packing paper with better supportive properties than flat paper alone. Hemming is a process of folding the edge of sheet metal onto itself to reinforce that edge. Seaming is a process of folding two sheets of metal together to form a joint. Hydroforming is a process that is analogous to deep drawing, in that the part is formed by stretching the blank over a stationary die. The force required is generated by the direct application of extremely high hydrostatic pressure to the workpiece or to a bladder that is in contact with the workpiece, rather than by the movable part of a die in a mechanical or hydraulic press. Unlike deep drawing, hydroforming usually does not involve draw reductions—the piece is formed in a single step. Incremental sheet forming or ISF forming process is basically sheet metal working or sheet metal forming process. In this case, sheet is formed into final shape by a series of processes in which small incremental deformation can be done in each series. Sheet metal can be cut in various ways, from hand tools called tin snips up to very large powered shears. With the advances in technology, sheet metal cutting has turned to computers for precise cutting. Many sheet metal cutting operations are based on computer numerically controlled (CNC) laser cutting or multi-tool CNC punch press. CNC laser involves moving a lens assembly carrying a beam of laser light over the surface of the metal. Oxygen, nitrogen or air is fed through the same nozzle from which the laser beam exits. The metal is heated and burnt by the laser beam, cutting the metal sheet. The quality of the edge can be mirror smooth and a precision of around 0.1 mm (0.0039 in) can be obtained. Cutting speeds on thin 1.2 mm (0.047 in) sheet can be as high as 25 m (82 ft) per minute. Most laser cutting systems use a CO2 based laser source with a wavelength of around 10 µm; some more recent systems use a YAG based laser with a wavelength of around 1 µm. Photochemical machining, also known as photo etching, is a tightly controlled corrosion process which is used to produce complex metal parts from sheet metal with very fine detail. The photo etching process involves photo sensitive polymer being applied to a raw metal sheet. Using CAD designed photo-tools as stencils, the metal is exposed to UV light to leave a design pattern, which is developed and etched from the metal sheet. Perforating is a cutting process that punches multiple small holes close together in a flat workpiece. Perforated sheet metal is used to make a wide variety of surface cutting tools, such as the surform. This is a form of bending used to produce long, thin sheet metal parts. The machine that bends the metal is called a press brake. The lower part of the press contains a V-shaped groove called the die. 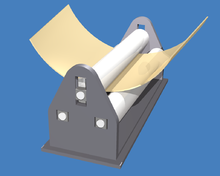 The upper part of the press contains a punch that presses the sheet metal down into the v-shaped die, causing it to bend. There are several techniques used, but the most common modern method is "air bending". Here, the die has a sharper angle than the required bend (typically 85 degrees for a 90 degree bend) and the upper tool is precisely controlled in its stroke to push the metal down the required amount to bend it through 90 degrees. Typically, a general purpose machine has an available bending force of around 25 tonnes per metre of length. The opening width of the lower die is typically 8 to 10 times the thickness of the metal to be bent (for example, 5 mm material could be bent in a 40 mm die). The inner radius of the bend formed in the metal is determined not by the radius of the upper tool, but by the lower die width. Typically, the inner radius is equal to 1/6 of the V-width used in the forming process. The press usually has some sort of back gauge to position depth of the bend along the workpiece. The backgauge can be computer controlled to allow the operator to make a series of bends in a component to a high degree of accuracy. Simple machines control only the backstop, more advanced machines control the position and angle of the stop, its height and the position of the two reference pegs used to locate the material. The machine can also record the exact position and pressure required for each bending operation to allow the operator to achieve a perfect 90 degree bend across a variety of operations on the part. The picture shown is air bending. Press brake bending is a different machine. But similar. Punching is performed by placing the sheet of metal stock between a punch and a die mounted in a press. The punch and die are made of hardened steel and are the same shape. The punch is sized to be a very close fit in the die. The press pushes the punch against and into the die with enough force to cut a hole in the stock. In some cases the punch and die "nest" together to create a depression in the stock. In progressive stamping, a coil of stock is fed into a long die/punch set with many stages. Multiple simple shaped holes may be produced in one stage, but complex holes are created in multiple stages. In the final stage, the part is punched free from the "web". A typical CNC turret punch has a choice of up to 60 tools in a "turret" that can be rotated to bring any tool to the punching position. A simple shape (e.g. a square, circle, or hexagon) is cut directly from the sheet. A complex shape can be cut out by making many square or rounded cuts around the perimeter. A punch is less flexible than a laser for cutting compound shapes, but faster for repetitive shapes (for example, the grille of an air-conditioning unit). A CNC punch can achieve 600 strokes per minute. A typical component (such as the side of a computer case) can be cut to high precision from a blank sheet in under 15 seconds by either a press or a laser CNC machine..
A continuous bending operation for producing open profiles or welded tubes with long lengths or in large quantities. Rolling is metal working or metal forming process. In this method, stock is pass through one or more pair of rolls to reduce thickness. It is used to make thickness uniform. It is classified according to its temperature of rolling. 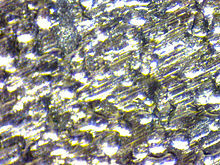 1.Hot rolling: in this temperature is above recrystallisation temperature. 2. Cold rolling: In this temperature is below recrystallisation temperature. 3. Warm rolling: In this temperature is used is in between Hot rolling and cold rolling. Spinning is used to make tubular (axis-symmetric) parts by fixing a piece of sheet stock to a rotating form (mandrel). Rollers or rigid tools press the stock against the form, stretching it until the stock takes the shape of the form. Spinning is used to make rocket motor casings, missile nose cones, satellite dishes and metal kitchen funnels. Stamping includes a variety of operations such as punching, blanking, embossing, bending, flanging, and coining; simple or complex shapes can be formed at high production rates; tooling and equipment costs can be high, but labor costs are low. Alternatively, the related techniques repoussé and chasing have low tooling and equipment costs, but high labor costs. A water jet cutter, also known as a waterjet, is a tool capable of a controlled erosion into metal or other materials using a jet of water at high velocity and pressure, or a mixture of water and an abrasive substance. The process of using an English wheel is called wheeling. It is basically a metal working or metal forming process. An English wheel is used by a craftsperson to form compound curves from a flat sheet of metal of aluminium or steel. It is costly, as highly skilled labour is required. It can produce different panels by the same method. A stamping press is used for high numbers in production. ^ "Design Guide: Sheet Metal Fabrication" (PDF). xometry.com. ^ Lodhi, Veerendra Singh; Jain, Prof. A.K. (30 April 2014). "A Review of Experimental Study of Spring Back Effect of Aluminum Sheet Metal". International Journal of Engineering Research and Science & Technology (IJERST). College Jabalpur (M P), India: Academia.edu. 3 (4): 2. doi:10.7763/IJET. ISSN 2277-9655. Archived from the original on 20 February 2017. Retrieved 14 July 2015. ^ Green, Archie (1993). Wobblies, pile butts, and other heroes : laborlore explorations. Urbana u.a. : Univ. of Illinois Press. p. 20. ISBN 9780252019630. Archived from the original on 14 July 2015. Retrieved 14 July 2015. ^ Simpson, Pamela H. (1999). Cheap, Quick, & Easy: Imitative Architectural Materials, 1870-1930. Knoxville: University of Tennessee Press. p. 31. ISBN 978-1-62190-157-0. ^ Staveteig, Kaaren R. "Historic Decorative Metal Ceilings and Walls: Use, Repair, and Replacement" (PDF). PRESERVATIONBRIEFS (49): 1–3. Retrieved March 20, 2019. ^ a b c d e f g h i j k l "Sheet metal material". precisionsheetmetal.com. Archived from the original on 2009-06-15. ^ "Sustainability of Aluminium in Buildings" (PDF). European Aluminium Association. Retrieved 20 June 2013. ^ "Central Steel & Wire Company Catalog" (2006–2008 ed. ): 151. ^ "ASTM A480/A480M-13b Standard Specification for General Requirements for Flat-Rolled Stainless and Heat-Resisting Steel Plate, Sheet, and Strip". ASTM International. Archived from the original on 2014-02-22. ^ Rowlett, Ross (26 July 2002). "Sheet Metal Thickness Gauges". University of North Carolina at Chapel Hill. Archived from the original on 19 July 2013. Retrieved 21 June 2013. ^ a b Oberg, p. 2502. ^ "ASTM-AISI Thickness Tolerance Ranges" (PDF). CoyoteSteel.com. Archived (PDF) from the original on 5 August 2012. Retrieved 20 June 2013. Oberg, Erik; Jones, Franklin D. (2004). Machinery's Handbook (27th ed.). New York: Industrial Press. ISBN 0-8311-2700-7. Parker (2013). Building Victory: Aircraft Manufacturing in the Los Angeles Area in World War II. Cypress, CA. ISBN 978-0-9897906-0-4. 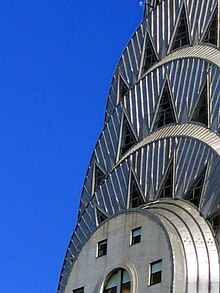 Wikimedia Commons has media related to Sheet metal. "Manufacturers Standard Gauge History". Steel Market Update. "Sheet Steel Gauges and Thicknesses" (PDF). Sheet Steel Facts. Canadian Sheet Steel Building Institute. April 2009.